Major Jeremy S. Wilkinson is a 1993 graduate of Cambridge High School, where he was a High School State Champion and All-American in wrestling. Upon graduation, Major Wilkinson enlisted in the United States Marine Corps with a guaranteed Infantry contract, where he served more than 20 years of active duty time. Major Wilkinson transitioned from the enlisted ranks to the officer ranks at Staff Sergeant upon graduating from Norwich University with a Bachelors in Criminal Justice. Serving his last tour as the Operations Officer for 1st Battalion 2nd Marines, Major Wilkinson retired as a Major select. During his time in the Marines, Major Wilkinson deployed multiple times in support of Operation Iraqi Freedom and Enduring Freedom as a Marine Infantryman. His awards include the Purple Heart, Meritorious Service Medal, and multiple awards with Combat Distinguishing Devices. 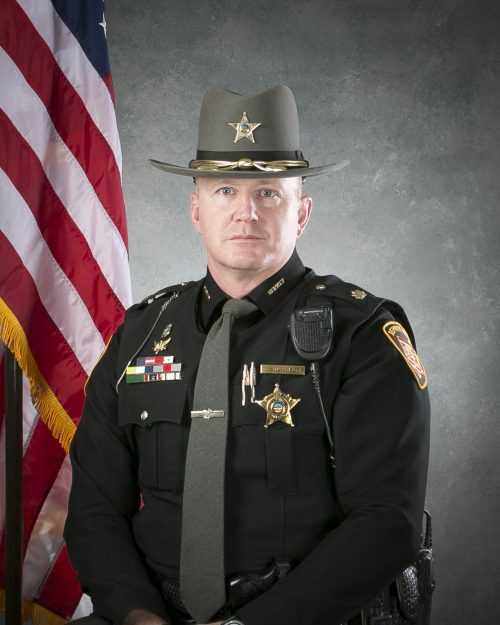 In 2013, Major Wilkinson accepted a position with the Guernsey County Sheriff’s Office and was promoted to his current rank of Major in January 2019. He has his Master Criminal Investigator Certification and will complete his Master Evidence Technician Certification in 2019, then move to complete a Master’s Degree. Major Wilkinson also serves as the Commander of the SRT (Special Response Team), where he implemented and tracks training standards, improved physical standards and creates operational plans to brief the SRT of each mission and to ensure safety of its members. The SRT is utilized for drug raids, high risk warrants executions, hostage rescue, dignitary and court protective details, surveillance operations, capture high risk fugitives and other incidents that pose a substantial risk to the public or deputy safety.